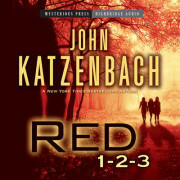 David chats with thriller novelist and former journalist John Katzenbach about his latest work Red 1-2-3. Three of his novels have been made into feature films: In the Heat of the Summer (adapted for the screen as The Mean Season), Hart’s War starring Bruce Willis, and Just Cause starring Sean Connery. His other books include The New York Times bestseller The Traveler; Day of Reckoning and The Shadow Man. Katzenbach was a criminal court reporter for The Miami Herald and Miami News and a featured writer for the Herald’s Tropic magazine.